The decision to get a divorce is not made lightly. Couples will often spend years participating in marriage counseling, couples retreats, and other forms of therapy in order to salvage a relationship. Once spouses have exhausted their options and decide to move forward with a divorce the process is often time consuming. Contested divorces in Florida can take six months or longer, especially in counties with busy courts. After the divorce is finalized there are still important matters that require attention, and one thing that is often overlooked is updating wills and living wills after a divorce. Wills and living wills are both extremely important when it comes to estate planning. Both documents are designed to make your surviving family and legal representatives aware of your final wishes when you are unable to communicate. In the state of Florida a will is a legal document that determines how your estate will be distributed after you pass away. A living will is meant to provide instruction regarding end of life care in situations when you are no longer able to provide informed consent or otherwise communicate. During a marriage it is not unusual for adults to create a will that will protect their spouse. Both partners want to avoid any potential problems with the transfer of property and money in the event of their unexpected death. After a divorce an adult may want their parents, siblings, children, or others to inherit their property or money. 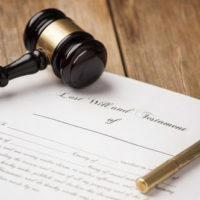 Unfortunately, if a will is not updated after a divorce, the new heirs could find themselves in a difficult position if the former spouse is still named in a properly executed will. Living wills present a similar potential for legal problems if they are not updated following a divorce. If your former spouse is still named as the person authorized for making decisions regarding your end of life care, it could limit the ability of your family to make legal choices. Failing to keep your living will current may strip your caretakers of the ability to communicate any new medical decisions you have previously discussed. One of the greatest fears of any caretaker is leaving those dependent on them without proper care and supervision. Wills give caretakers an opportunity to make provisions for their minor children and any adults who are reliant on them. Appointing a legal guardian for children or a responsible adult to oversee the finances of an incapacitated adult is often part of a will. Following a divorce a person may wish to remove a former stepparent or spouse from the role of potential guardian. Making changes to an existing will or living will requires the assistance of a professional. Failing to creating a will or living will that adheres to Florida law may lead to a court questioning the validity of the entire document. The Mander Law Group is able to help you create or update a will following a divorce. Contact our conveniently located Dade City office today to schedule your consultation.